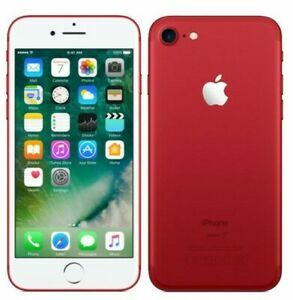 For endless possibilities in the palm of your hand, choose this red finished iPhone 7. The iPhone 7 has 128 GB of built-in memory, giving you enough space for your apps, texts, and videos. Great for playing games and multitasking, it is built with a quad-core processor so that you can quickly download graphics-heavy content. The phone features a 12-megapixel resolution camera, providing you with extraordinary detail and improved picture quality. Use this iPhone 7 for lightning-fast connectivity. This device is compatible with Virgin Mobile, Boost Mobile, Sprint Carriers. Battery Standby Time Up to 240hr. Thank you! Fast delivery. Good seller. As close to perfect as you can get in product and service! Item was in great condition as seller stated. Purchased multiple things from seller, and both were great. Would recommend!! Way better than my old phone. Holds battery way longer, no glitches or freezing occured. Very good camera quality. Will buy one more of the same type from eBay.